For first time home buyers, investing in real estate needs serious consideration. Before purchasing a property, a buyer needs to know the common payment options made available to him so he can weigh in his choices and get his money’s worth. Here’s a brief run-through of the common payment options when buying a property in the Philippines. For the lucky individuals who are members of the Pag-IBIG fund, you can simply apply for a loan and they will take care of your payments to the real estate developer. This government organization also has its own set of systems, which include paying through credit card or though Globe G-Cash for easy payment. You may refer to their site for more information. Here’s a small trivia. This office whose primarily role is to help Filipinos build a house for their families through its Home Development Mutual Fund is now just widely known as Pag-IBIG. Does anyone still know what this actually stands for? The acronym actually stands for Pagtutulungan sa Kinabukasan: Ikaw, Bangko Industriya at Gobyerno. The most conventional route would be through bank financing. This course can be tedious for people who do not have enough financial history with all the paperwork needed. But already, banks have designated specialized staff whose job is to make people’s lives – where business transactions are involved – easier. The queue for these tables are usually shorter too so it isn’t much of a hassle. In this type of payment scheme, home buyers directly pay their monthly amortizations to the property developer. One of the advantages of this option is that it requires less paperwork compared to the other schemes, thus making the processing of payments faster. The downside of this is that it requires higher interest rates. In Primavera Residences’ case, options 2 and 3 are made available to property buyers aside from spot cash and deferred payments. 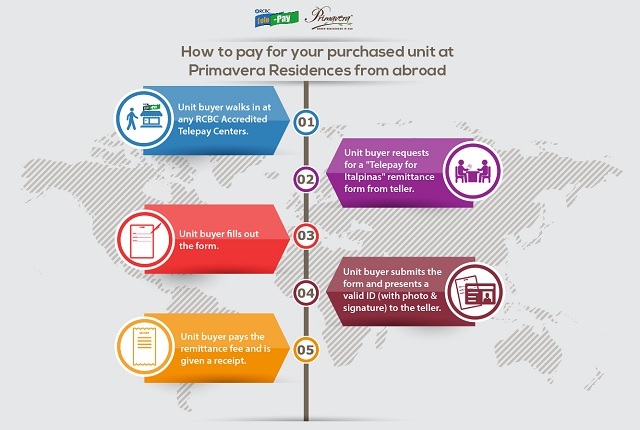 Overseas Filipino Workers (OFWs) who would like to purchase a condo unit at Primavera Residences from abroad through the in-house financing scheme can do so via RCBC’s Telepay remittance service. Recently, Primavera Residences developer Italpinas Euroasian Design and Eco-Development Corp. (ITPI) signed an agreement with the Rizal Commercial Banking Corporation (RCBC), allowing condo buyers to pay for their purchased unit through this remittance service. Through this option, a buyer only needs to fill up a form in any of the RCBC Accredited Telepay Centers all over the globe, and pay according to schedule. These are just some of the options that property buyers need to consider when buying the home of their dreams. Whatever option you pick may entail some efforts on your part. But it does really feel good coming home to a space you can call your own. Primavera Residences, Mindanao’s premiere green building, is avant-garde not only in its promotion of condo living in now bustling Cagayan de Oro, but also in its advocacy of sustainable development, promising a high-performance design that allows for minimizing the buildings’ impact on the environment. When it comes to investing in real estate in Cagayan de Oro, condo buyers might want to consider Primavera Residences.